Web Services maintains the development of the district website, management of Google Apps for Education and other web initiatives. Our mission is to support Mesa Public Schools employees in the use of web-based technology. Since 2007, Web Services has developed and supported Architeck, the district's web content management system. Today, Architeck hosts more than a million unique pages of content. Every day, Architeck serves an average of 160,000 pages to over 65,000 visitors. 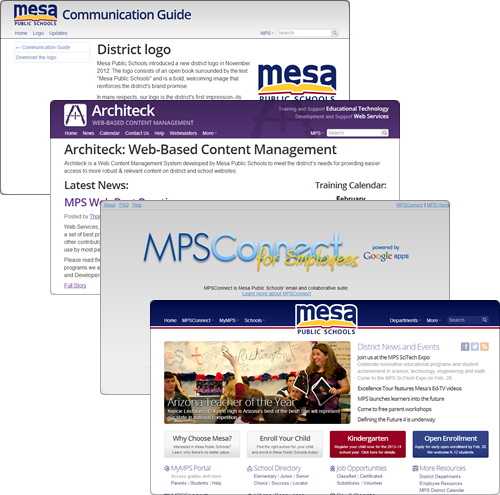 In 2009, Web Services migrated district employees to MPSConnect--email, calendars and documents powered by Google Apps. In 2011, MPSConnect was expanded to provide accounts for more than 28,000 secondary students. Web Services also assists in district communications and branding initiatives as well as other technology projects. Questions about Architeck, Email and More? Visit our FAQ page for answers or who to contact.